I have a chicken in the house. Yes, she lives in a cage. She's about 6 weeks old I think. I'm not really thrilled about having a house chicken, but it's also kinda fun. See, I had these two hens that were raising some chicks. Let's call them Barn Hen and Garden Hen. Their chicks all hatched the same day (2 and 3 chicks, respectively). Sadly, Barn Hen was killed by a hawk a couple of days ago (#$%& Cooper's hawks!!!!!). I attempted to give her chicks to Garden Hen, and was reminded that although chickens aren't very good with counting, they do have a pretty strong sense of recognizing when something looks different. 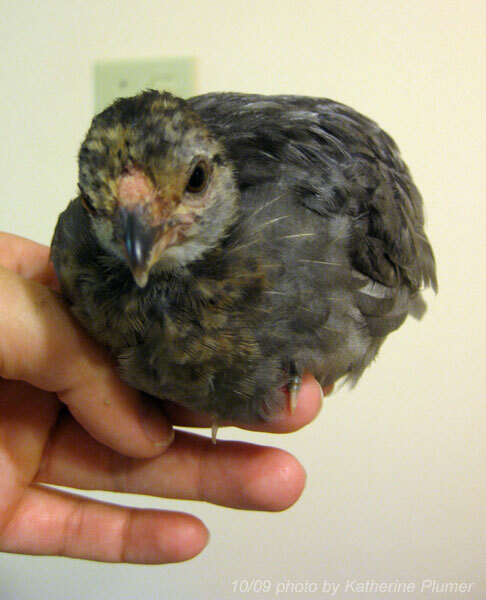 Garden Hen, whose own three babies are dark colored, accepted the little orphan black chick without incident (hey, looks just like the others!). But she rejected the little blue brassy back chick, whose pale slate feathers make her stand out like a sore thumb (yes I hate that expression now, since my sore thumb really did stick out!). When a hen rejects a chick, she will kill it if she gets the chance. I wasn't about to let that happen. I really did not want a house chicken. Foolishly, I decided I could try to trick Garden Hen by darkening the little blue chick. So I um... tried to dye her black. It didn't work. She's considerably darker than she was, but Garden Hen wasn't so easily fooled. So... Blue Chick lives in the house now. She's adorable. In two days she has gone from an untamed wild animal to completely spoiled rotten. If I open the cage door, she flies out onto my lap. Cute, eh? She may end up being a good bird, or she might not, she's way too young to tell. But this bird is never going to auction! If she doesn't end up being breeding quality, she will need a good home as someone's pet. Oh, and not a house pet. Chickens are crappy house pets. Literally. You can't potty train them. Anyway, time will tell what she turns into, but if someone around here thinks they might want the cutest darn pet chicken ever, there may be the opportunity for that. I hope the people who think all chicks should be raised by hens get a chance to see that in action some time. Even when she's hatched a bunch herself, one day a mother hen might decide she doesn't like the white chicks, for example. Hopefully you can find that out in time to save them. That's a pretty ugly camo job. I know, it was a pretty failed attempt, but all I have is ink so that's not the greatest thing to work with as dye! But she's still cute. I applaud you for going the extra mile to save this chick. Good Luck.